If you say the words crumb cake to me I am instantly onboard and will most likely respond with, “Where?” and “Yes, please,” without saying or asking much else. Crumb cake made a regular appearance in my house as a kid in two forms: first, as an Entenmann’s square crumb cake with the lovely layer of white powdered sugar on top of the first layer of cinnamon and brown sugar crumb. 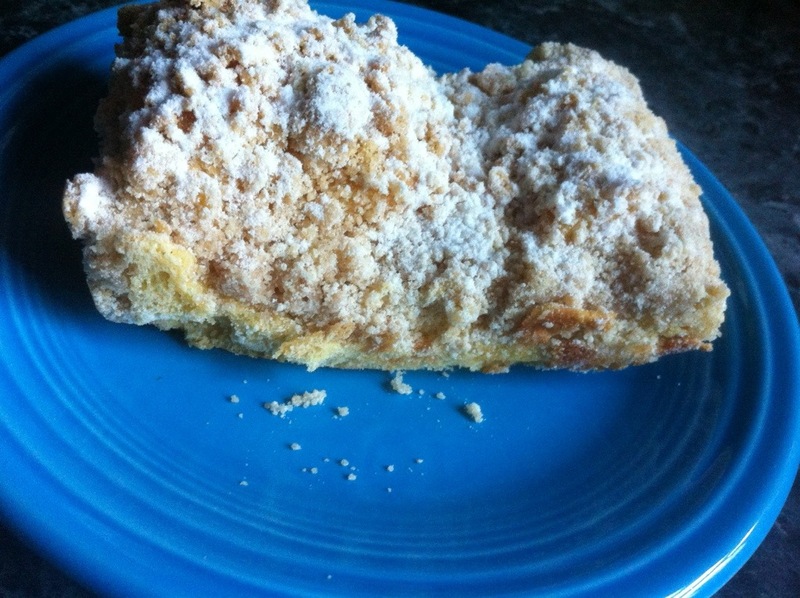 If you have never experienced an Entenmann’s square “classic” coffee cake you must try one; all local grocery stores sell them, but it has to be the square one with the white powdered sugar topping, not the round version. 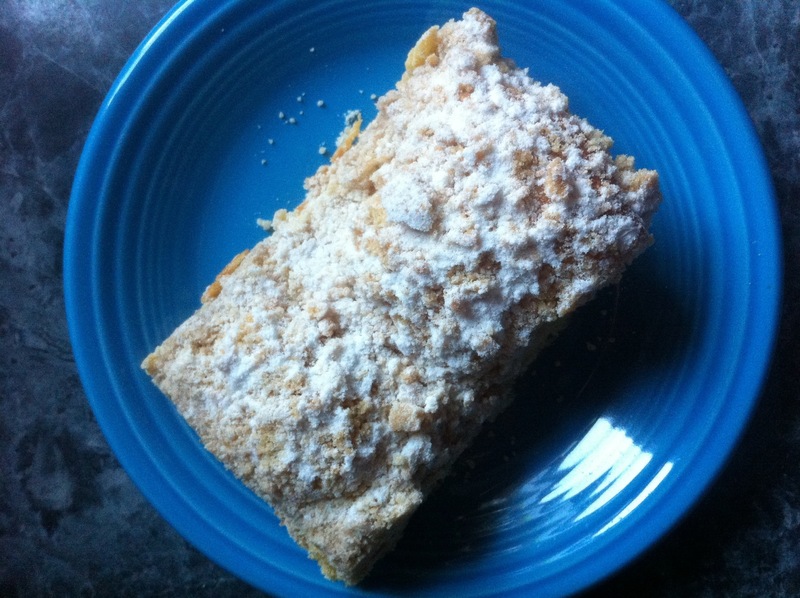 The second form in which crumb cake appeared in my home as a kid was as a rectangular individual-sized piece of crumb cake from a local bakery called Nice n’ Fresh, which is now owned by Chaves Bakery, in Bridgeport near the Stratford town line. A few times each month, actually it was more like once each week, my grandfather would get up early and bring home these crumb cakes from the bakery. One of my favorite surprises is waking up to the smell of coffee brewing and seeing the unmarked white cardboard bakery box in the kitchen. The box and the anticipated bakery treats were always from Nice n’ Fresh because they were (and still are) one of our favorite local bakeries. Unopened bakery boxes will always be as exciting to me as unopened presents on Christmas morning. Chaves’ Nice ‘n Fresh crumb cake is made in large trays, yet each piece is essentially formed on the tray so they’re pretty easy to pull apart AND each piece has plenty of crumb topping. The cake itself is a doughy cake and is a little chewy. However, the cake is not as dense as the Entenmann’s cake, instead it is lighter and will spring back if you gently press it down. The topping is a mixture of light brown sugar and powdered sugar. The funny thing about my family and crumb cakes is that we love the thick crust of cinnamon and sugary goodness that forms around the edges, so much so that my family would fight over the edges. All too often the center of the square Entenmann’s coffee cake would be left with the dead center of the cake as the last piece standing. If you got stuck with the center piece it was either the last little bit left, or you didn’t pay attention and missed an edge piece with all that glorious crumb crust that forms along the edges. 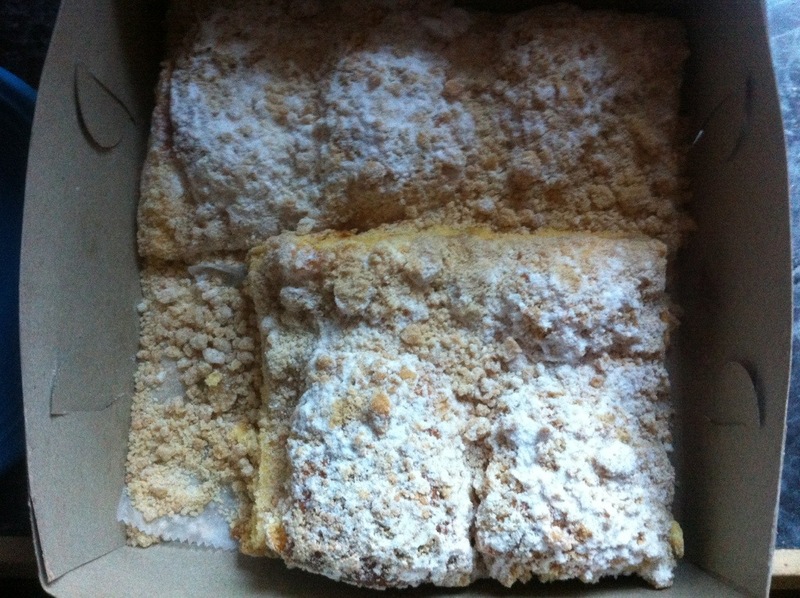 The amazing part of the Nice n’ Fresh Bakery crumb cake is they’re made so each piece has some of this sweet crust formed around the edges; each piece has a good amount of crumb topping and is what I call a very crumb-y crumb cake – the best kind of crumb cake. And while each piece has a rather thick layer of crumb topping around the edge, the crumb cake is a nice balance of the topping with the cake itself. 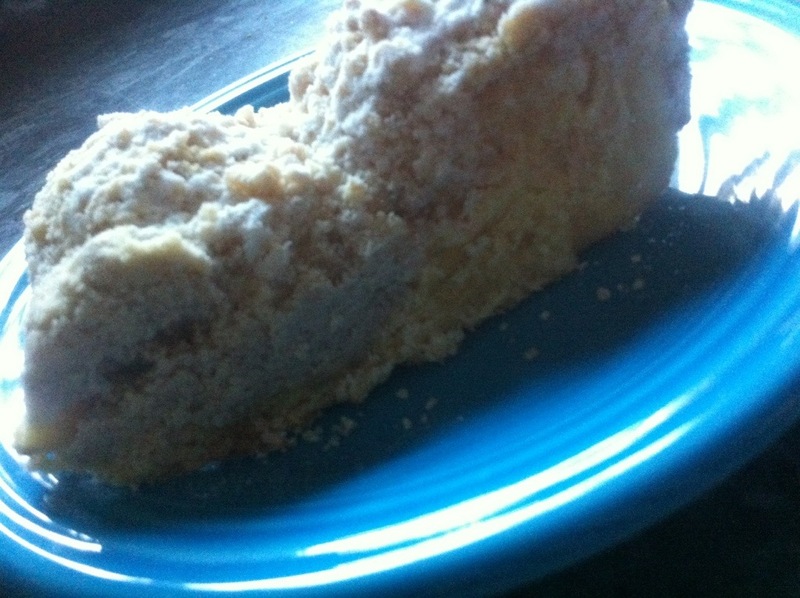 As you can see, the piece of cake dips down a little in the center showing how the cake is simultaneously light with places of the thick crumb-y topping. 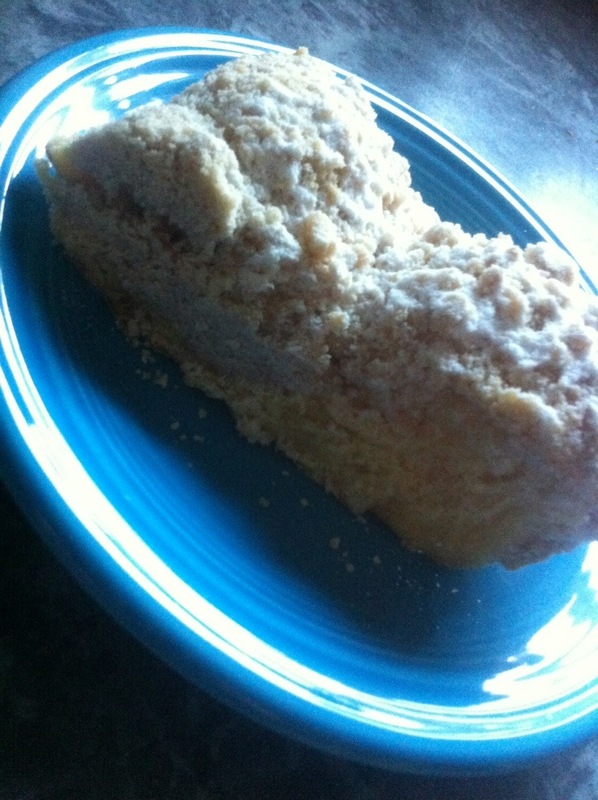 I’m going to eat my piece of wonderfully crumb-y Nice n’ Fresh crumb cake with a cup of coffee now. Why don’t you head over to the bakery and get yourself a piece to try?